The lookbook for the Karl Lagerfeld for Macy's Impulse collection is available for viewing via Fashionologie. The collection includes high collars, dresses (Yay!) and the color palette is black,white and pink. After scrolling thru the lookbook I decided I really want to try on the floral print dress. I already own similar items in the collection minus all those high collars (my neck needs to breathe) so for me the floral print dress is the stand out item. There was a Karl Lagerfeld for Macy's Impulse Press launch party in NYC on August 3, 2011. 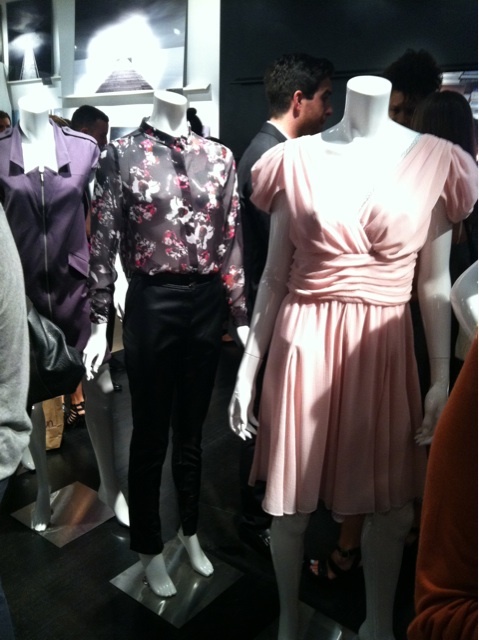 The party goers took a few pics of the collection on display and shared via twitter. Thank You party people. I am very happy to see the collection via these pics. I have a better idea of what to expect when I stroll thru Macy's on August 31, 2011.